200 pages | 15 B/W Illus. This book outlines the history of squatting in Sweden and analyzes the conditions under which squatting has intensified and declined in the country between 1968 and 2017. 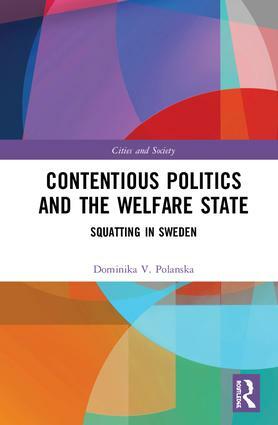 With close attention to the relationship between civil society and the state in the Swedish context, and the manner in which this relationship, together with attendant political, media and movement-based discourses, shapes the possibilities that exist for collective action, the author draws on two key concepts – those of the narrative of consensus and discourse – to present an analysis of squatting as a form of contentious politics and the “successful” story of civil society development as decisive for its emergence and development in the country. A study of the way in which confrontational actors question both the property relations inherent in capitalism and the authority of the welfare state and its institutions, Contentious Politics and the Welfare State will appeal to social scientists with interests in urban studies, political sociology, squatting, social movements and the relationship between the welfare state and contentious social actors. Dominika V. Polanska is Associate Professor of Sociology at the Institute of Housing and Urban Research, Uppsala University, Sweden and the author of several studies on squatting and housing movements in Poland and Sweden.